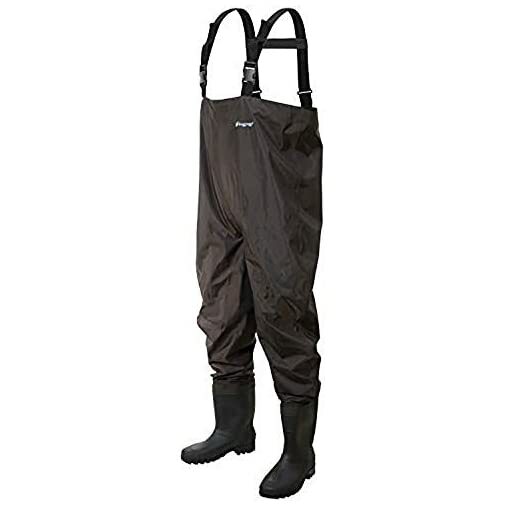 The Frogg Toggs Rana II PVC Bootfoot Chest Wader features a nylon-reinforced PVC upper with waterproof boot attachment and 100% taped seams. Adjustable H-back web suspenders with durable quick release buckles ensure a secure and comfortable fit. Flip-out chest pocket and top draw cord allow wearers to store their outdoor essentials. Non-insulated 2mm PVC boot with cleated or felt outsole provide protection for feet.